The Dividist Papers: President Barack Obama - Let the healing begin. 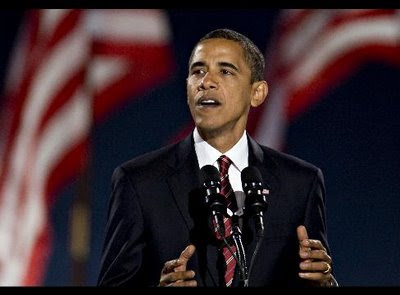 President Barack Obama - Let the healing begin. Congratulations to Barack Obama, the Democrats, and David Axelrod. It was a brilliant campaign, well executed, and a historic result in which all Americans can take pride. The story of Barack Obama is indeed a story that could not be written in any other country in the world. "Let us resist the temptation to fall back on the same partisanship and pettiness and immaturity that has poisoned our politics for so long... while the Democratic Party has won a great victory tonight, we do so with a measure of humility and determination to heal the divides that have held back our progress... And to those Americans whose support I have yet to earn-- I may not have won your vote, but I hear your voices, I need your help, and I will be your president too." I was inspired by the sentiment. This morning, in a spirit of reconciliation and unity, I turned my browser to the biggest and most influential Democratic bloggers and thinkers, in order to better understand how Obama and the Democrats will reach across the divide, listen the values of those who did not vote for him, and unify the country. "...healing cannot occur unless the crimes that have brought our nation to such a ruinous condition - morally, economically and politically - are investigated thoroughly and a proper penalty imposed. Most importantly, the bent machinery that allowed, nay encouraged, those crimes must be rebuilt with safeguards so that they never occur again. That's not vengeance. It's justice." "...we have an imperative to take advantage of a historic opportunity to break the conservative movement's backs and crush their spirits." I learned that unity is certainly possible, if only the 48% who did not vote for Barack Obama accepts the mandate delivered by the 52% who did. "In this election, Obama proudly stood up for progressive values and the superiority of progressive policies; John McCain, in return, denounced him as a socialist, a redistributor. And the American people rendered their verdict." "...this is the progressive movement's mandate. A mandate to end the war. A mandate for universal health care. A mandate to solve the financial crisis even if it means nationalization and harsh measures against Wall Street. A mandate to repair the environment. A mandate to restore the middle class. A mandate for a truly free and open media. This is our mandate." Think Progress - "A Progressive Mandate"
John Judis - "America the Liberal"
".... If, on the other hand, Obama and the Democrats take the advice of official Washington and go slow--adopting incremental reforms, appeasing adversaries that have lost their clout--they could end up prolonging the downturn and discrediting themselves... That's not the kind of change that America needs or wants"
Jim Vandehei - "A New World Order"
"Democrats have the capital in a headlock, holding more power at both ends of Pennsylvania Avenue than they have had for at least 32 years (Carter) and, more realistically, 44 years (Johnson). Obama seems ready to press this advantage. The best early clue of his ambitions: he wants sharp-elbowed Democratic Rep. Rahm Emanuel to run his White House." " The most important aspect of this Tuesday's election is to finalize their humiliating repudiation and to bury them for what they've done." "The new Democratic majority is a progressive electorate. It wants Democratic and progressive change. The notion of a "Center Right" Beltway Agenda is not what they want. Democrats must respect this. If they choose to instead adopt a Broderite agenda, they will be voted out of office..."
Matthew Yglesias - "The Mandate"
"People want Obama to implement his agenda, and his agenda is a progressive one — cutting carbon emissions, expanding access to health insurance and early childhood education, making the tax code more progressive, and spreading the wealth around building broad-based prosperity." It is going to tough, but I firmly believe that Barack Obama will indeed unify the left with the far left, pull in the moderate left, and be the President that speaks clearly for the entire sweeping 52% mandate they represent. Finally I'd like to extend congratulations to my moderate, centrist, libertarian, and conservative blogging brethren who embraced Obama's rhetoric of change and hope. Divided and Balanced.™Now that is fair. Oh, sure. Take all the fun out of it. 3% wasn't a mandate but 6% is? Who knew? Personally I think they'd be spouting the exact same lines even if it was Kucinich that got voted into office. But OTOH, you are on the winning team, and I am a pathetic loser. Still, I am starting to have a little fun with this. I expect I will be able to have a lot more. 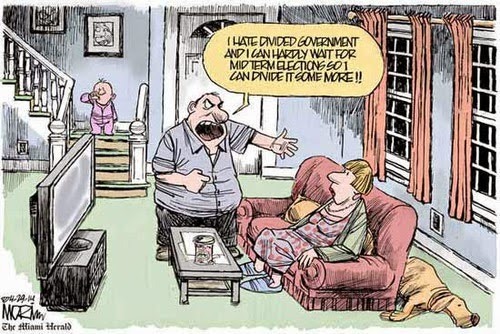 You can give up your idea of divided government. In 8 years the percentage of the voters that is white will be a couple of percentage points lower than today. than means that the Republicans will have to get 60% of the white vote to stay relevant. 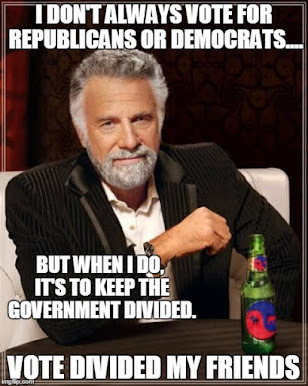 The real divided government quesiton should be what will happen after the Republican party completes its collapse and the former Republicans start voting in the Democratic primary. I largely agree with your conclusion, although I disagree with the rationale you use to get there. You and I have discussed this in comments here and at TMV before. I find your premise that racial demographics to be the only determinant of voting preference to be wrong headed and offensive. We are not going to litigate that question on this blog again. You'll have to take that elsewhere. That said, I agree with several of your points. If the Dems show fiscal responsibility and legislative moderation, the need for a divided government will indeed be moot. You can assess for yourself how likely that scenario is. My take is that promoting the divided government rationale will be more important now than ever. I also agree that the GOP is staring into the abyss and is teetering on the brink of complete irrelevance as a political force. It is a reasonable question to ask whether people should continue to invest effort in trying to restore the Republican party to meaningful opposition. If the GOP brand is so damaged that it can never recover voters from a broader demographic, including young voters, we would be better off if it was left to die and replaced by something new. There is no precedent for a successful 3rd party in US politics. But there is a precedent for a new party replacing an existing party that had lost its way (Republicans replaced the Whigs). Finally, I agree that it will difficult to reassert divided government in the next election, but it can be done in four years. Retaking the presidency is not necessary to restore divided government. The Senate is the best shot and will have to be the focus for the next two elections. these are all issues I intend to discuss in future blog posts. That reminds me that the Whigs are trying to stage a comeback. Wild. I had not heard about the "Modern Whigs". From the website it looks like they are getting some traction. I guess I'll have to keep an eye on them. I would've thought that they could have done better with the name than to try and revive an old brand. If I recall my history, Lincoln left the Whigs because they supported the continuation of slavery. That is quite a bit baggage to drag around, even if these are the "modern whigs" and there is no real connection. Thanks for the tip. I ran across them while checking up on what the third parties were doing this election season. Despite the baggage if they can succeed in promoting themselves as a fiscally conservative, socially liberal, pro-second amendment party I could see them successfully getting a a few folks elected into the House. That is of course provided they don't completely implode like the Reform party before then. OK, my son just turned me on to this site. My political motto is, "Absolute power causes absolute corruption." You go, guy. One problem: I live in Oregon, where there is no Republican Party, and where the organized parties that there are just defeated what would essentially have been a nonpartisan voting system. Hmmm. Well, four and eight years ago we were talking about the demise of the Democrats, and now we're pretending the Republicans will self-destruct. 'Tain't so. There seems to be a subcurrent in this country that causes government to become divided over time, which is all to the good, even though there are the occasional two- to six-year stretches of absolute corruption. Let's see what happens now; even Jesus Obama can't prevent corruption when everything is one-sided, is my guess. We are on the same page. I do think the GOP is fighting a real uphill battle to repair the damage to their brand with young people and minorities. On the other hand, a lot of young people were very excited about the Ron Paul "peace, freedom, limited government" message, most of which was rejected by main stream Republicans. You are probably right about the current GOP fortunes being part of a cycle. But I do wonder whether it wouldn't be easier to just put the party out of its misery and make room for something new. Thanks for stopping by, and thanks for the comment. If you were obama what economic package will you give? A provocative short clip asks This question: This is taken from Davis korten new book on agenda for a new economy.